It’s the hard truth: Earning money online takes time. So, receiving your payment shouldn’t. Payoneer partners help you get paid faster. And in some countries, they help you save on fees. And that’s why we look for Payoneer partners. You can receive the money you earn online directly onto your bank account as local transfer and save on fees; you can also opt to withdraw money via local ATM. Payoneer is available in more than 210 countries. Don’t have an account yet? Create your free account today. In the list below, you’ll find affiliate programs, ad networks, selling platforms where you can get paid via Payoneer. I use Payoneer Since 2010. PayPal is not available in my country. It was the only way I could get paid when I started to work online. So, I ended up searching for programs using Payoneer as their payment method. Getting a way to get paid is super important. Finally, I could work online and get real money in my pocket. My income was no more digital. I could shop at local store, withdraw cash at local bank and spend online. You too, you can make money online with Payoneer partners. I sort them by programs having the lowest payment threshold. But before the list, what is Payoneer? Payoneer is company offering a convenient way to get paid online and actually get that money physically in your hands. It is simple! You sign up for free and wait for approval. Your account dashboard will show different currencies so you can get paid in euro, dollar or GBP. After your first payment, you’ll get more access to faster payment and more convenient withdrawal methods. Did you create your free Payoneer account yet? Start now, get $25 welcome bonus when you accumulate $1000 in incoming revenue. Get your FREE Payoneer account now! It took times. But I investigated and found legitimate Payoneer partner websites/programs. Dive in to pick Payoneer online jobs to build a steady income on the internet. How to make money with Payoneer partners? I wanted to add this clarification first. 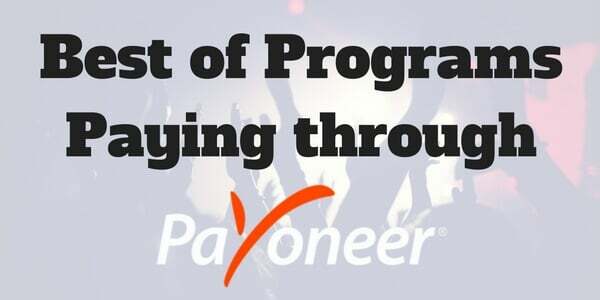 This post is not JUST about how to make money online with Payoneer refer a friend program, I introduce it below as ONE of the ways to get paid via Payoneer. It is about online work at home jobs and paying programs that are Payoneer partners. People often call them “Payoneer online jobs”. A Payoneer partner is a program, a company, which is allowed to pay you directly through Payoneer. The similarity between these programs is the payment methods. They differ in the way you can use them to earn revenue. You can earn money with Payoneer from anything you do on the internet. So, whatever your skill level, your fields of interest, you’re ready to go with this Payoneer partners’ list. TeeSpring: Design and sell t-shirts online for free and get paid via Payoneer. 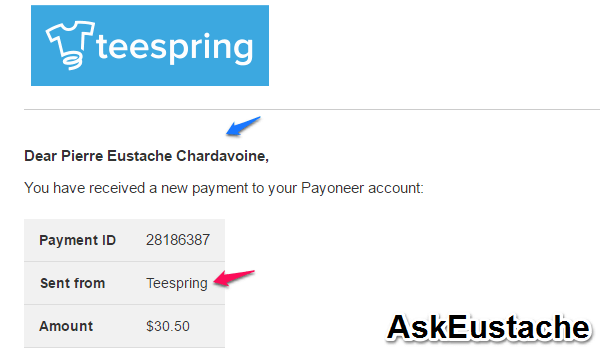 TeeSpring pays through US Bank transfer, PayPal, and Payoneer. The minimum payout via Payoneer is $15. Create your account on TeeSpring.com now using that link. Set your revenue per t-shirt: average is $7 per t-shirt. You can create an account to refer your friends and get $0.50 per t-shirt they sold (You can earn $2500 max from each referral). It is a win-win game. It allows you to create stores to offer discount and increase your earning. Affiliate Marketing beginners – Sell T-shirts with TeeSpring: This course is for someone who just heard about TeeSpring and doesn’t know how it works. I did not take it because I knew about the site when I discovered the course. But I don’t know about you. I do my best to avoid spending on Facebook ads. I promote my designs on Pinterest and Facebook groups. Ezoic: Boost your display ad revenue with this Google certified partner. You need a blog with more than 10,000 page views per month to join. You get higher CPM ads than Adsense alone. I get up to $40 per mille visitors on this blog. And it works with Adsense, media.net, and many other ad networks to display the highest paying one. Related post: How I earn up to $43 RPM with display ads. The minimum payout on Ezoic is $20 via Payoneer bank transfer. ViralStyle: Like TeeSpring, you can use ViralStyle to make money selling t-shirt designs. The minimum payout is $20 through Payoneer. They pay via PayPal too. You can create storefronts, build email lists of your customers and upsell your t-shirt designs. Like TeeSpring, you can make money when people buy on their marketplace or you can promote your designs to boost your income. They allow you to sell t-shirts with no minimum, set it to relaunch automatically and indefinitely. Your t-shirt will never be out of stock. RevenueHitz: This is one of the best CPA ad networks because you don’t have to manage offers. They offer sticky footer, interstitial, pop-under ads, and banner. They fill 100% international traffic and select the best offers to maximize your revenue. The minimum payout is $20 through Payoneer and PayPal, and $500 via wire transfer. They are not purely CPC or CPM ad network, even if they display such ads once in a while. Most ads will be CPA ads where you get paid huge money per conversion (free signups, downloads, game play, etc…). Sharecash: Sharecash is a paid per download file. Get up to $1 for each download, the minimum payout through Payoneer is $20. You earn for referring your friends. Get paid into your free Payoneer account when your revenue reaches $20. Earn 20% from your referred members and start completing tasks to get paid from $1 to $250 per task. ( See SeoClerks’s proof of payment and tips – I earn more than $00 with this site already. More than $190 are referral income.)! Fiverr: Sell your micro freelance services through Fiverr. It is like SeoClerks. You list your services and get paid when someone hires you to complete such services. They pay through Payoneer at $20 minimum, PayPal at $1, Bank transfer at $50 and US bank transfer at $5. Exoclick: It is a cost per click, cost per view, cost per action ad media for the web and mobile platforms. The minimum payout is $20 through Payoneer weekly. The site requires 50 unique daily visitors to get accepted as a publisher. Kontextua: Kontextua is a display, in-line and ads-in-image advertising network. They are paying through Payoneer at $20 minimum. Payoneer Refer A Friend: Payoneer allows you to get paid to refer your friends. You both earn $25 when the referred member accumulates $1000 in transactions using Payoneer services. You get paid your $25 then. Matomy SEO (Formerly TLA – Text Link Ads): It is a link marketplace where advertisers buy links to place on a publisher website. You will get paid monthly if your account equals or is greater than $25. Get paid 10% recurring income during two years from publishers and $25 per advertisers who spend $25 in advertising. freelancer: It is the world most large freelance marketplace. Get hired and complete outsourcing projects. Withdraw as soon as you accumulate $30 in balance account. Freelancer is a good source of income for freelancers and affiliate. I have made more than $200 in affiliate sales with it. Get 10% of jobs from your referred employees and employers for their first 90-days membership. UpWork: It is an outsourcing and freelance marketplace where you can make money online and get paid through Payoneer at $20 minimum payment threshold. BlueSnap: promote products as a marketer and get sales. Get paid through Payoneer, Ach, wire, and PayPal, at $35 minimum! You can sell your products online as well using BlueSnap and get paid via Payoneer. But it fits large retailer and developers. If you want to increase affiliate sale, you can check out this course about getting traffic to affiliate links even without a website. check it out. The minimum payout is $50. You can opt to receive your income via Payoneer. 99designs: Make money as a freelance designer. Take part in logo contests, t-shirt design contests, car wrap and website design. Get paid through PayPal, Payoneer, Skrill when you accumulate $50. There is a detailed post about Infolinks on AskEustache if you want to know more. Copacet: Copacet is a gaming related ad network which pays on NET 5 through Payoneer when your earning reach $50. Get up to $15 per mille views for pop-under game advertising. Envato Marketplace: Envato is a marketplace where designers and artists can cashout their earning via Payoneer, PayPal, and Skrill. The payment threshold is $50. Sell themes, plugins, video, audio and graphics. You can join as an affiliate and promote products from any of these sites in the network and get paid via Payoneer. Ad4Game: Earn high revenue from your gaming site with ad4game. Add pop-under, Google video pre-roll ads, IAB banner, footer ads, site skin, editorial content, gaming CPA offers, etc… Monetize your gaming site all the ways. Peerfly: Peerfly is a CPA affiliate marketing programs paying through Payoneer at $50 minimum payment threshold. It is a high paying CPA program; earn up to $300 per action (signups, leads, sales, visits, etc…). depositphotos.com: Earn up to 15% from referred sales; get paid up to $20 for placing depositphotos.com banners on your photography related website. Get paid via Payoneer. CpaLead: This Cost per action advertising offer content locking, high paying offers to affiliates. They pay through Payoneer, ACH, PayPal and check at $50 minimum. Get paid daily, weekly, Net-15 or Net-30. Template Monster Affiliate: Promote WordPress, Joomla, Magento responsive theme and PowerPoint templates. Get paid 30% per sale. Receive your money through Payoneer when you reach $100 in account balance. The site pays through PayPal, wire transfer, and WebMoney too! Start promoting by sign up here. Dreamstime: Dreamstime is a professional stock photos sites for free and paid photos. You earn money as contributor or affiliates. Get paid $5 per signup and 10% per transaction as affiliates. Earn 25 to 60% per sale of photo you contribute. Get paid at $100 minimum payout through Payoneer, Moneybookers, PayPal and check. IStockPhotos: Stock photos site by GettyImages.com! Get paid 15 to 45% per sale of photo you contribute to the photo bank. Get paid through Payoneer, check, PayPal and MoneyBookers at $100 minimum. PropellerAds: Propeller Ads Media is a CPM, CPC ad network which pays through Payoneer when you reach $100 in earning; $500 through wire. They accept bloggers of any size traffic. Any traffic level blog gets approved to run native ads, pop under. Sites getting 10000 views a day get approved to run banner ads as well and get up to $5 CPM. They approve instantly and have ads for international audience. DailyMotion: Publish your videos on Dailymotion or embed Dailymotion videos on your website to earn money each time someone watch videos you own or people’s videos you embedded on your website. Get paid when you reach $100 via Payoneer, PayPal or bank transfer. There are sites that are paying through Payoneer, but I don’t know their minimum payment threshold. There are also programs which pay through direct transfer. You can cash-out your money via Payoneer US payment services. Selz: Sell your e-books, musics, videos and services on Selz selling platform. They don’t pay directly via Payoneer. But you can setup to get receive sales revenue via 2Ckeckout which pays through Payoneer. They allow you to sell on WordPress, Twitter and Facebook. Taboola: Native ad network. Show sponsored related articles on your website and get paid per click. 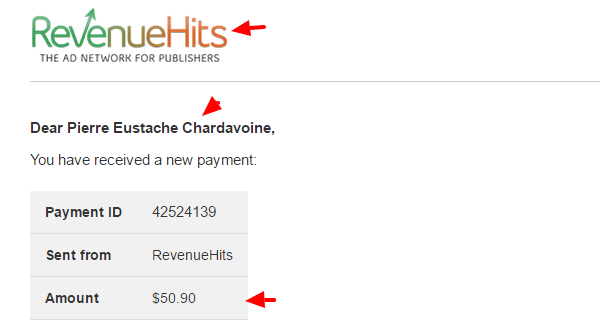 There are paying publishers via Payoneer. They require 500,000 page views to run their widget. GetResponse Affiliates: Promote GetResponse email marketing software. You can take test a 30 days trial here. Get paid 33% recurring income per month. They pay through PayPal, wire and ACH. You can receive your earning using Payoneer US and EU payment services. Join and make money online with Payoneer partners which set a low minimum payment threshold and are reputable among internet money makers. Don’t limit yourself to Payoneer’s official partners. I am trying to find the website, which provide us the facility to accept the donations on their website and send to our payoneer account. Is there any websites like this? is there any etsy alternative with payoneer? This site was real helpful to me. Hi, Ahsan! I am glad this article was helpful to you! Adf.ly and Sharecash are two payoneer partners that I like! Since 2010, Exoclick has Payoneer as payment option. Did you check out the account settings page to set up your payment method? waht is best site to earn moneyy from all this in the list ? adfly is good but i need visitors anyithyng elese here ?? Awesome Post! Especially for some of us. When i started online i struggled to find online work at home jobs that pay fast because due to my geographic location i am not legible for paypal which most online business prefer to use. This is real gold. I am glad, Felistas, that this post helps you! Hi Pierre, thanks for a nice job. Payoneer is the best alternative for those people who are not allowed to use PayPal for receiving payments online. A lot of sites are now adopting them because of the ease of payment processing and for their wide acceptability. The money PayPal is leaving on the table is wisely collected by Payoneer. PayPal might have a large customer base, but because they reject some countries, they are the real losers here. My country alone has so many internet users as the most populated country in Africa. Imagine how many customers from there are now being serviced by Payoneer. I believe that one day, PayPal will realise its foolishness and have a change in their discriminatory policies. Thanks once again. Do have a lovely weekend. can some one provide me with other companies in the “work from home industry” (not affiliate marketing) that pays bigger than share cash and adfly. I Have Three Questions So Please guide me. Q1: I haven’t received $25 of Sign up Bonus Why? Q2: If i refer some of my friends i will earn $25 once or any more profit? Q3: How can i job online from home at Payoneer,any job available? Hi Umair, thanks for stopping by. A1: You will receive your $25 signup bonus once you accumulate $100 in transactions ( sending and receiving payments). I explained that in the article and it is displayed on Payoneer sign up page. A2: You will earn $25 for each friends who create an account and make a cumulative $100 in transactions. A3: Find a program in the list of payoneer partners within that article, earn money with it and receive your earning via Payoneer. I give a summary of each program and you can find further explanation for some of them on detailed articles on this blog. I hope I was helpful. If you want to make anything clearer, just ask. Someone registered through my affiliate link several months ago and has earned more than $100 through Freelancer but Payoneer has not paid me. I got in touch with me and they kept giving me excuses. Lat time, they said I should ask the person to write them. They are supposed to have the records with them. Why should somebody start writing them first before they pay? I know very well that the referral has surpassed the $100 benchmark. I don’t think this is good for Payoneer’s reputation. Normally the system would detect everything to notify you when someone signed up under you or when you earned the bonus. First, you may have to wait 3 months if everything is OK. It means, if the system recorded the signup as coming from you. Second, the referred users may clear his cache and remove your tracking cookie. That way, when he signed up, the system may not record him as your ref. In that particular case, I think that person can write Payoneer to let them know you referred him. This is the scenarios I could think of. However, I am a Payoneer cardholder like you. The customer care system can dig into the system to help you better. It is real, Medina! I make money online since 2010 and I embed some images as proofs of payment within the post. No program is perfect. Problems happen unfortunately. It’s something the service but sometimes, it’s the customer. I can not tell you what to do. I am just a regular Payoneer account holder for more than six years. And I had no problem. But I have to say that I just use Payoneer to withdraw cash and pay for online services. I withdraw money via ATM and store them on my bank account as soon as possible to pay less fees and spend at local local shop. Payoneer is not perfect. But it is not a bad service. Just learn to avoid the known problems people faced. suppose you were to create a awesome headline? I ain’t saying your content isn’t solid, however suppose you added something that grabbed people’s attention? Can you show me more about how to get paid from Gumroad through Payoneer? Hey guyz,i’m from ethiopia.This article are best for me b/c in ethiopia if u want to earn money from online,U will can’t earn with paypl.b/c paypal is not supported in ethiopia.So Which website are the best … to earn huge $ With out Investment? I need open payoneer account. Payoneer saved me too. It is the most convenient method I can use to cash out. Wire transfer costs a lot. Dreamstime has competition. But with dedication, you can do it. Hi! Pierre, thanks for the post. TeePublic (print on demand T-shirts like Teespring) has both payment methods: Paypal and Payoneer**. **this makes it an official Payoneer partner? I mean, just having the Payoneer payment option makes it a partner? Yes, just having Payoneer as an option for payment makes a company a Payoneer partner. Do you have experiences with TeePulic? Yes, I have worked with T-public more than a year, I really recommend it. **pay with payoneer at minimun 20$ or more, with paypal at 1$. Super helpful. Thanks a lot. Only if payoneer could allow users recieve payment through their own websites. I can’t agree more, Joseph! I just use FastSpring to sell online which pays via Payoneer. I can’t sell online course with them. I just sell downloadable content. I am glad you find one that works for you! I use many of them. Thank you very much. I just read you. I recently signed with Payoneer after working hard and failing to be paid by PayPal. I come from one of those underprivileged countries of Africa. I had almost given up online business but now I feel re-energized. Let me try. Hi Irenee. I can relate. I had a PayPal account frozen with funds on it. I work right now only with companies where I can get paid via Payoneer or wire transfer. Or if I can use the referral income to pay for the service. I am glad I could help. Hello Eustache,first of all i would like to say thankyou for this article! My question is that I Can’t sign up to payoneer account. When i click for ‘next’ button there is no change in page or simply the ‘Next’ button couldn’t work on the sign up form. may be if you can help me by creating my account,call me please.